Kenneth Carl Braatz, 94, of Waupaca, died on Sunday, April 14 surrounded by family at Bethany Pines Nursing Home. Ken was born on February 11, 1925 to Leslie and Mae (Mugridge) Braatz in Milwaukee. He was baptized in 1944 at St. John Lutheran Church in Newburg. Ken married the love of his life, Sylvia Schmidt, on June 17, 1945 at St John Lutheran Church, Newburg, united in marriage by Pastor Alfred Maaske. God blessed Ken and Sylvia with 72 years of marriage. Ken was preceded in death by his loving wife Sylvia; his dear parents Leslie and Mae Braatz; father-in-law and mother-in-law, Alfred and Clarinda Schmidt; brother-in-law Allen Schmidt; and precious great grandson Tyler Peterson. Ken is survived by his children: Judi (Robert) Rehm of Weyauwega, Deb (Jeff) Lederhaus of Appleton, Craig (Leigh) Braatz of Waupaca, and Lori (Joe) O'Brien of Shiocton. His grandchildren: Amy Ankenbauer, Tony (JoyLyn) Rehm, Jessica (Kirk Boutwell) Prasnicki, Jason (Paula) Prasnicki, Suzanne (Doug Swanke) Braatz, Sadie (Andy Erickson) O'Brien, Devin (Keyln) O'Brien; great grandchildren: Jackie, Jonothan, Julia, Robert, Isaac, David, Ashlie, Brandon, Josie, Callie, Ethan, Felicia, Savannah, Charlie, Leo, Hudson and Abel; 10 great-great grandchilren, 4 step grandsons, and 4 step great grandchildren: sister-in-law Arlene Schmidt of Cascade and numerous nieces and nephews. Dad found and shared his greatest joy in loving and serving God, his family and his country. He built beautiful homes with his Dad in Milwaukee and Mequon, and then Dennison Building in Clintonville. Dad loved hunting, spending time with family, singing and giving great hugs. 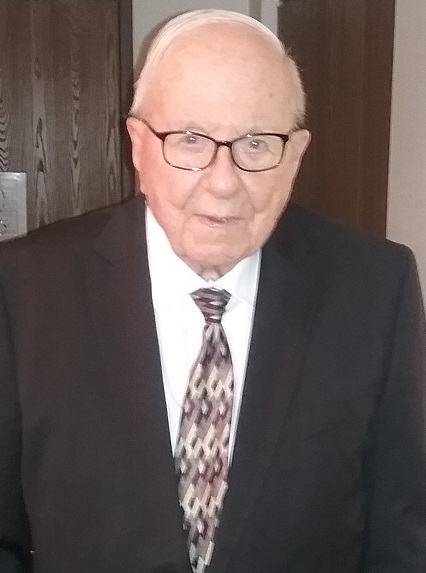 A longtime member of Emanuel Lutheran Church in New London – he enjoyed ushering, Bible classes, volunteering reading at Emanuel Lutheran School, church services at St. Joe’s Nursing Home; and Meals on Wheels. A Funeral to celebrate Ken’s life and blessings will take place on Monday, April 22, 2019 at 12 p.m. at Emanuel Lutheran Church, New London with Pastor Heiges officiating. Friends may gather for visitation from 10:00 a.m. to 12:00 p.m. before the service. Committal service will be held at 2:30 p.m. at Oakwood Cemetery in Weyauwega. The family would like to thank Pastors Heiges, Tiefel and Schultz at Emanuel Lutheran Church – New London, Pastor Siemers of Immanuel Lutheran Church – Waupaca; the loving staff at Bethany; and the kind staff of Theda Care Hospice. “Onward, Christian Soldiers, marching as to war, with the cross of Jesus going on before.”Thank you Dad for being a great example of God’s love through your leadership, love and affection.